A demonstration took place on Wednesday afternoon, July 20, 2011, in the Williamsburg section of Brooklyn New York, an anti Zionist neighborhood with a population of over 35,000 ultra Orthodox Jews, a neighborhood where not one Israeli flag flies. The theme of the demonstration was to boycott the Israeli food company Osem, which is known for its ongoing partnership with the Israeli “Jewish National Fund [JNF]”. The event was attended by dozens of Rabbis and students who symbolically burned food packets of Osem products imprinted as follows: “JNF for Israel forever. A portion of the proceeds of the sale of each bag will go to support JNF’s Indoor Recreation Center in Sderot, Israel”. Rabbi Mordechi Weberman, a Williamsburg resident, said, that “by buying Osem products, one supports the JNF, an organization which has been condemned by the vast majority of Orthodox Jewish leaders for many decades. He continued “The Williamsburg community is outraged by the fact that Osem shamelessly announces on its website that they contributed to the JNF in the past 5 years, the sum of 2 million US dollars. 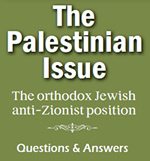 The Rabbi explained “The community refuses to be a partner in supporting the State of “Israel”, a entity which is a rebellion against the Almighty in each and every way”. “This money is being used to support an entity that commits ongoing atrocities against all its adversary, the indigenous Palestinian people and also the anti Zionist Jewish people”. “Zionism, the ideology that is the foundation and reason for the existence of the State of Israel, is a transformation of Judaism â€“ the religion and subservience to the Almighty, into a contradictory concept â€“ a materialism and nationalism, void of the Almighty in its essence”. “In addition, the mere existence of the State of Israel, is forbidden according to Jewish teachings. According to the Torah, Jews are in a divinely decreed exile and are forbidden to create an independent sovereign State, nor to rebel against any nation”. 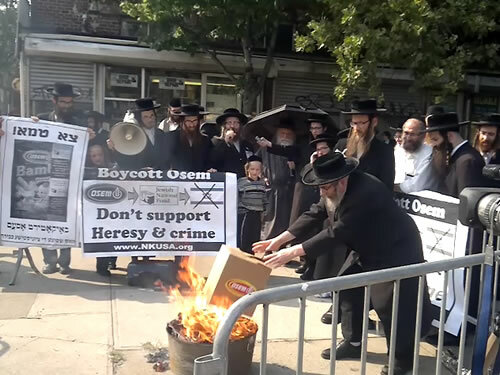 “Therefore Anti Zionist Orthodox Jews have gathered in a demonstration to boycott and symbolically burn Osem products, in the Williamsburg section of Brooklyn NY”. 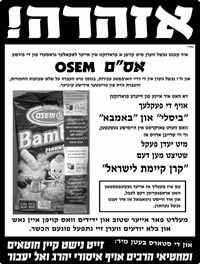 You may be enticed by your local grocery stores into buying products manufactured by Osem, with that you may be supporting an entity that violates the most serious transgressions in the Torah. 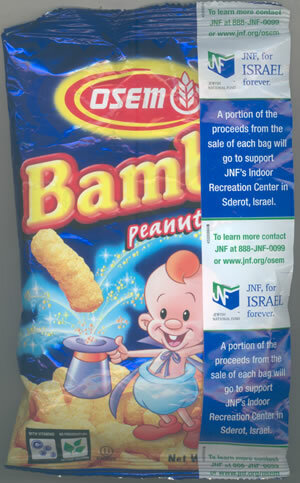 Here you can see one of their products “Bissli” and “Bamba” snacks that are being sold in our neighborhood, which has imprinted on the package, that from every piece sold, a percentage is donated to the Jewish National Fund.